G-Trainers enable people to improve mobility and health, recover from injury and surgery more effectively, overcome medical challenges that limit movement, and enhance physical performance. 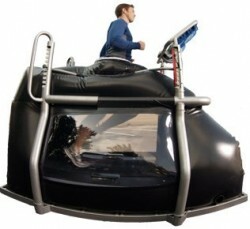 If you have a sports injury, the G-Trainer can reduce the impact on your injured foot (leg, ankle, etc.) to make running easier while you heal. The same can be true for someone trying to learn to walk again after a severe injury. The video promoting it, however, only brags about how quickly the runners can finish mileage. What’s the point of beating the 1 mile record if you can only do it in the Alter G-Trainer? I doubt you’ll ever see something like this at your local gym. You might see it at a physical therapist’s office, but even then, it seems like such a specialty product that this might be the only way you’ll ever see it in action. How interesting. Not just the wacky technology that’s out there, but the fact that you wrote about it. “It’s allows me to bump up my mileage but stay healthy. I usually run five to 10 pounds below my actual weight…” (page 71). I read that and thought “What the heck is THAT?” Now, I know. You are right on time! Product recalls for everything from rusted parts to pressure failures. No ISO 13485 Quality Assurance Program which is required for medical devices. And no UL, CE, RoHS or EU Certificate of Compliance.